Most books on plants and birds state that in order to attract birds to the garden one needs to plant red flowering plants. There is no doubt that red flowering plants may well attract honeyeaters but Eremophila veneta (which used to be called Eremophila metallica) is always being investigated by the Honeyeaters. This plant has silvery coloured flowers which blend with the foliage. It is definitely not the colour of the flowers that attracts them. I am convinced that they can smell nectar rich flowers and are attracted by that. 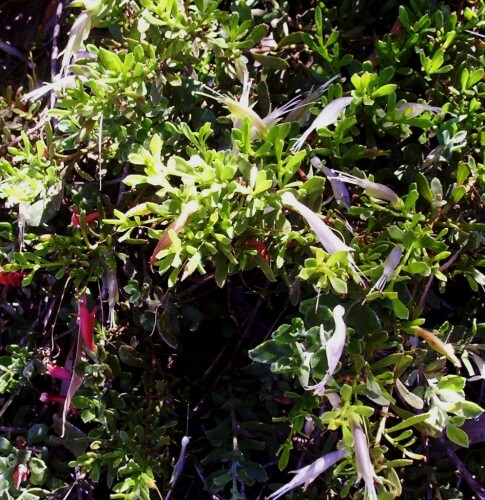 Eremophila veneta is a hardy ground covering plant with silver and green flowers. It grows to about 15-30cm tall by 1-1.5m wide. It thrives in a dry, hot position with good drainage. I am sure that the Shingle Back Lizards find the water in the bird bath which is on the ground in the same way. I have watched them walk quite a distance in a very purposeful manner, heading in a direct line for the dish.